Philadelphia, PA - On Monday, May 14th at 1pm, at the twin flagpoles at Philadelphia City Hall, Jewish peace activists held Philadelphia Mayor Jim Kenney accountable, demanding he condemn Israel's indiscriminate killings and injuries of grassroots protesters and journalists in Gaza. While Mayor Kenney and several city council members gave speeches at the first-ever raising of the Israeli flag at City Hall in Center City (an event sponsored by the Jewish Federation of Greater Philadelphia), Jewish Voice for Peace members and allies held a peaceful, solemn vigil in memory of the over 100 unarmed protesters that have been killed by Israeli forces in Gaza since March 30th, over 50 of whom were killed today. More than 35 Philadelphia Jews and allies gathered to ask why Mayor Kenney is attending an event celebrating Israel, which killed over 50 unarmed protesters in Gaza today, bringing the total death toll to over 100 since the end of March. JVP members and allies held up a large banner displaying the names and ages of the 51 Gazans who have been killed by Israeli forces from March 30th - May 11th, and also read their names out loud and sang songs of peace. Since late March, Palestinians have been protesting in Gaza under the banner of the Great March of Return. The protest will culminate tomorrow, May 15th, which is the founding of the State of Israel and marked by Palestinians as Nakba Day (the catastrophe). To date, Israeli forces have killed over 100 unarmed protesters and injured thousands more. Jewish Voice for Peace-Philadelphia is the local chapter of Jewish Voice for Peace, a national, grassroots organization inspired by Jewish tradition to work for a just and lasting peace according to principles of human rights, equality and international law for all the people of Israel and Palestine. JVP has over 200,000 online supporters, over 70 chapters, a youth wing, a Rabbinic Council, an Artist Council, an Academic Advisory Council, and an Advisory Board made up of leading U.S. intellectuals and artists. Tali Ruskin, a Jewish Voice for Peace committee member, said it's important that their concerns are heard. "We're ashamed that our elected officials are out here supporting the state of Israel and on our City Hall property," she said. "We are a group of Jews and allies demanding that our elected officials not celebrate the state of Israel, as they are actively engaging in a massacre of unarmed protesters in Gaza." 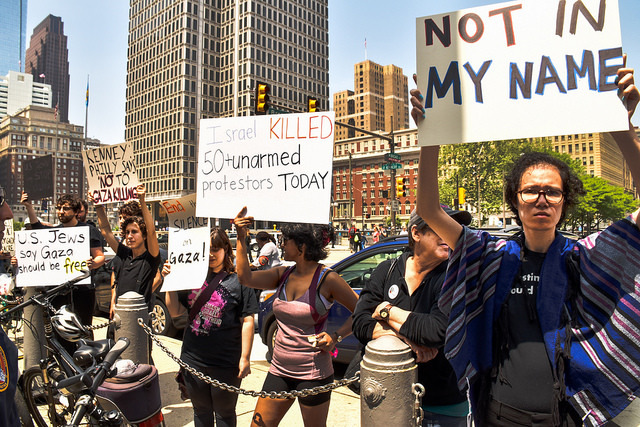 This is not the only Philadelphia event sparking protests over relations with Israel. At least three times, protesters have picketed outside the Philadelphia Orchestra, upset with the group’s June tour that includes stops in both Tel Aviv and Jerusalem. Among the celebrations was opposition from protesters with the Philadelphia chapter of Jewish Voice for Peace. “The sign I’m holding is a list of Palestinians murdered by the Israeli defense forces,” protester Elijah Blanton said. While a group of about a dozen Jewish Voice for Peace-led protesters — though more showed up as the event progressed — sang and stood outside of a barrier made around the area by sheriff and police officers, Lachs Adler acknowledged the violence in Gaza.